Students from Syracuse University are taking a stand against child abuse. April is Child Abuse Awareness Month. 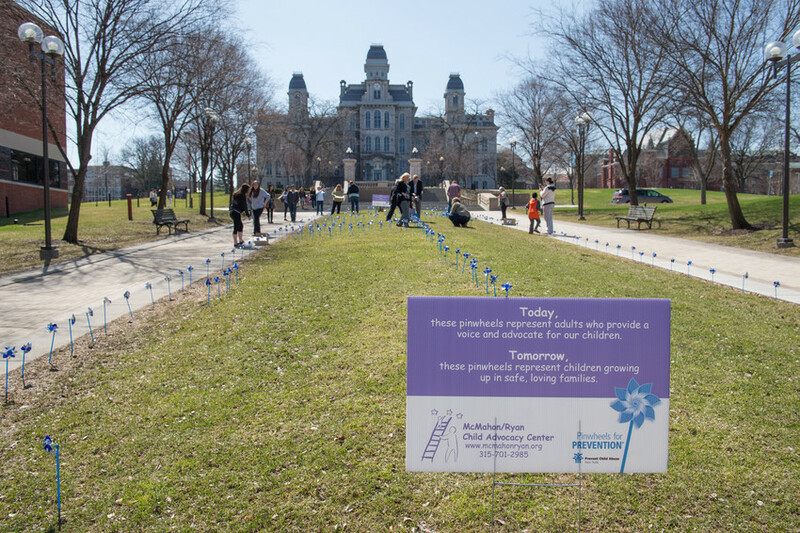 As they’ve done in previous years, students have partnered with McMahon/Ryan Child Advocacy Center to bring attention to the issue in a visual way: by planting pinwheels on campus. On Sunday, 720 pinwheels were installed on the lawn between the Schine Student Center and Newhouse buildings, with each pinwheel signifying a safe and healthy childhood. “It’s a very striking visual for a very important cause,” according to Brooke Tyszka, academic counselor for Falk College student services. Students in Kappa Omicron Nu, the national honor society program for Child and Family Studies majors, along with students in the Society for Public Health Education in the Department of Public Health, Food Studies and Nutrition at Falk College, and the Orange Pulse Dance troupe coordinating Pinwheels for Prevention. Money raised will to go McMahon/Ryan Child Advocy Center. McMahon/Ryan is a nationally accredited Child Advocacy Center and nonrofit organization dedicated to ending child abuse in Central New York through intervention and prevention education. 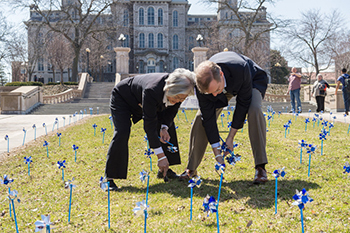 Chancellor Kent Syverud and Dr. Ruth Chen join in the effort to plant pinwheels in the lawn between the Schine Student Center and the Newhouse complex. Every six minutes in the United States, a child is sexually abused. One in 10 children will be sexually abused before the age of 18. Four children die every day from child abuse and neglect. In 2013, there were almost 7,000 reports of alleged child abuse or neglect in Onondaga County. Of those, 658 children were referred to the Child Advocacy Center for suspected sexual abuse or severe physical abuse. Forty-three percent were under the age of 6, and an additional 30 percent were under the age of 12. In 2013, the Child Fatality Review Team reviewed 13 unexpected child deaths in the county. The goal of the hard work by students, is to reduce the number of child abuse cases by raising awareness and funding.